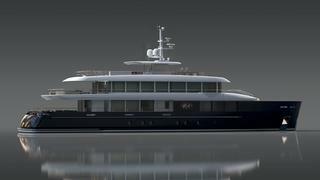 Camper & Nicholsons Yachts has announced an agreement with ISA Yachts for the Italian yard to build the Filante 42 superyacht. The revelation follows our September report that the historic English builder, now part of Leonardo Ferragamo’s Nautor Holding, would recommence business 40 years after it ceased the construction of large yachts in England. The new announcement confirms that the builder's plan, at least in the short term, is to work with an existing shipyard rather than set up its own dedicated facilities. The company is now called Camper & Nicholsons Yachts, rather than Camper & Nicholsons Yachting, as it was at the time of our previous report. The 41.8m Filante 42 will be the first of a range (previously known as the C&N Yachting 400 series) that Camper & Nicholsons Yachts describes as comprising ‘cutting-edge, genuinely offshore displacement motor yachts’. It features naval architecture by Horacio Bozzo, interior design by Michele Bonan and concept and exterior design by Camper & Nicholsons Yachts. Relatively compact dimensions, good manoeuvrability, reliable systems and twin 447kW Caterpillar engines are intended to allow passengers to travel to remote destinations with confidence. Italian builder ISA Yachts was founded in 2001 and builds yachts of up to 80m in a 50,000 square metre yard. It has delivered 28 superyachts in 12 years.